Teachers in the Los Angeles Unified School District showed up en masse at yesterday's school board meeting with an outrageous demand - they want to be paid for their work. Back in January the LAUSD district rolled out a new payroll system. Soon, some teachers were being underpaid, some overpaid, and some not paid at all. Some teachers reported receiving paychecks of $0.99 for a full month's work. The system is now making deductions from the paychecks of teachers who are believed to have been overpaid, but the teachers themselves have no way of knowing whether they've been paid correctly or not. Blogger and L.A. third grade school teacher Jane at My Many Colored Crayons tells her own story here. United Teachers of Los Angeles, the union representing L.A. public school teachers, filed suit back in April. Blame is being tossed back and forth between Deloitte Consulting, which the district hired to create a new payroll system, SAP AG in Germany whose software the payroll system is based on, LAUSD and other elected officials. 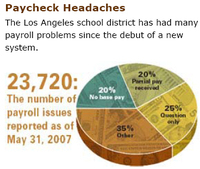 The graphic here showing how payroll problems break down is from Education Week's June story on the problem. It's been announced that all problems are expected to be worked out by June 2008. In the meantime, teachers are getting behind on credit payments and making do however they can. LAUSD even issued a letter teachers can print and send to their creditors as they beg for leniency on payments. Could the timing be any worse, what with the ongoing mortgage meltdown? With more than 110,000 employees and 708,000 students, LAUSD is the second largest employer in L.A. County, after county government. Demand for teachers nationally is expected to continue to be high for the next decade. Teacher turnover is also high, and the cost to school districts, taxpayers and students is significant. What's amazing is that under these conditions more L.A. teachers aren't leaving. Today's L.A. Times editorializes against a school practice of giving students class credit for assisting teachers with filing and grading papers. Perhaps it would help if the teachers themselves were being paid. Thanks for the mention & words of support. I think teachers aren't leaving because we care about our jobs and want to work with the kids. This is a terrible time for us.We know that the tens of thousands even millions of dollars that are going down the toilet to solve this problem will come out of future raises and most likely (shudder) our benefits package. It's bad enough that teachers are paid so poorly nationwide. Now to find out some in LA aren't being paid at all - that's shocking. The Education Week story quotes an SAP representative responding to complaints by saying, "These implementations require profound changes in the way the organization conducts business." Why can't they design software to fit existing accounting and payroll systems? Why should software drive how a school system conducts its business? And why would LAUSD (or any organization) buy software that isn't customized to fit their needs? Best of luck, Jane, to you and all the LAUSD teachers. Adult Educators have no help with this problem. Please continue researching industries under UTLA and the Community Colleges that are not committed to their flex time workers and as roving educators (see education week) are without classrooms, insurance, paychecks or advocates). AJ Duffy said...its illegal to make people work without being able to depend on their paychecks. Flex time instructors whether working 1 hour a month or being held back from work or working many hours are being hurt and do not have major representation. The word teacher means regular work to many people and means there is a work demand, but without a paycheck or promise of work assignment or regular use...this is hellacious. Research Wagner-Peyser in California, disability, dislocated workers and some of the cut backs and planning...teachers are not protected from this kind irregularity. Where do teachers go...they are demoralized, not protected, and walking out this Friday. 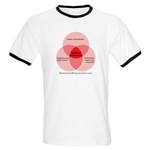 Support your favorite blog! Get cool stuff!